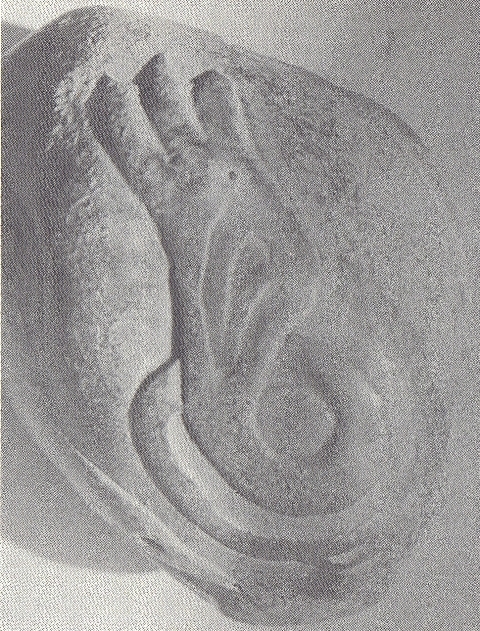 The Swan Stone from Burrows Cave, Illinois, bears a petroglyph of a serpent with a large head in the shape of the wing of a bird. It tells the famous story of the discovery of the sailing routes across the Atlantic during the Old Kingdom of Egypt. Finally, after a long struggle of several millennia people were able to reach the back side of the planet Earth. However, immediately after this success was a Comet Catastrophe which resulted in the Biblical Flood (c.2344 BC). Because of a precipitation of nine meters of water within a time period of four months more than half of the world population perished (2.6 million men). It resulted in the end of all ancient civilizations on Earth, including the Old Kingdom itself. The Swan Stone is a black slate stone having a length of 20 cm, a width of 15 cm, and a height of c.8 cm.1-3 It bears a nice petroglyph of a serpent finishing in a kind of wing (Fig.1). It is a so-called Burrows Cave artifact, found in a cave along a branch of the Little Wabash River near the town of Olney, in southern Illinois. This cave is situated at a distance of 100 miles due east of Cahokia, the ancient capital of North America. Further due east is Washington D.C., the present capital of the USA. All these very important places are located at the holy latitude of 39oN. It is the latitude of the West Azores, in the middle of the North Atlantic Ocean. These were the westernmost islands of the civilization in the Old World. However, the complementary latitude of 90o - 40o = 50oN also encodes the Fifth Dynasty, when all Crossings of the Atlantic were discovered. The Swan Stone should be placed in a vertical position, as shown in Fig.1. The surface of the Stone symbolizes the North Atlantic Ocean. The two tips of the Tail and the three feathers of the Wing confirm the 2 + 3 = 5th Dynasty, when these important discoveries were made. The two tips of the Tail at the bottom represent the 2nd king Sahure (c.2510-2498 BC), who discovered the two southern Crossings. The three feathers of the Wing on top represent the 3rd king Nefererkare (c.2498-2478 BC), who discovered the third, northern Crossing. A ship sailed from the Cape Verde Islands, with the wind and the current, over a distance of 2 Moiras= 20 degrees, to Cape Sao Roque (the holy Rock), Brazil, at 5oS. 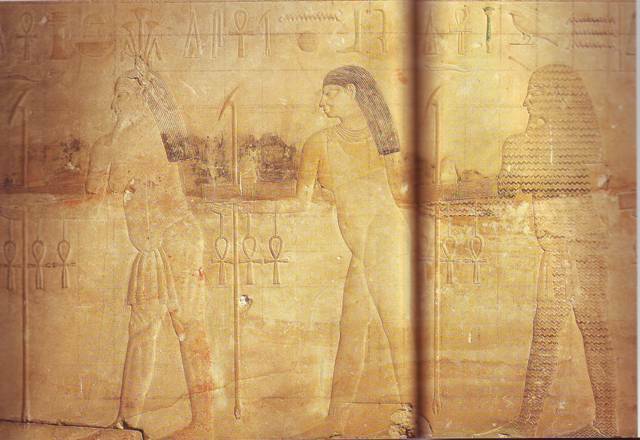 It illustrates that the 2nd king Sahure of the Fifth Dynasty discovered the Southern Crossing. The sailing direction of 30oSSW shows it was an Egyptian king from the Nile Delta, at 30oN. The same ship sailed from Newfoundland, with an initial sailing direction of 20oESE, with the wind and the current, over a distance of 2 Moiras to the two islands of the West Azores, and further to the five islands of the Central Azores. It confirms, that the 2nd king Sahure of the Fifth Dynasty also discovered the Return Route to the Old World. The Swan Stone shows the whole sailing route to the West Azores, at the holy latitude of 39oN (Burrows Cave). The circle in the center of the serpent illustrates this round trip. Together with the previous discoveries, it was also the first circumnavigation of the planet Earth. The Tropic of Cancer is the holy line of the Sun religion. At midsummer day the Sun is there at right angles above. The slow northerly movement of the Sun turns into a southerly movement. So, one believes in the Egyptian SunGod Ra. This latitude line crosses the River Nile at 23oN, as shown by the 2 tips of the Tail and the 3 feathers of the Wing (20o + 3o = 23o). It is the center of the Southern Egyptian Empire, but also the center of the Sun religion. King Sahure as well as king Nefererkare were the substitutes of this SunGod.4-9 In the Egyptian tradition these kings were represented by parts of an animal, by the split Tail of a Serpent, and by the Wing of a Swan, respectively. The circle in the center of the serpent now symbolizes the Moon, and the three feathers on top are the 30 days of the month. The split Tail shows the planet Earth was inside the Tail of this Comet for 2 Months, or 2 x 30 = 60 days. The latitude of the south cape as well as the 3 + 3 = 6 feathers of the wing confirm it. The falling rocks caused huge forest fires, and the melting ice of the Comet caused torrential rains. There were huge floodings everywhere. It was completely dark on Earth. This time period was probably the worst. After these two months the Earth left the Tail of the Comet. However, the three feathers on the lower half of the wing also symbolize the 30 days of the month. The whole climate on Earth was completely disrupted. The split Tail shows the planet Earth was outside the Tail of the Comet for another 2 Months, or 2 x 30 = 60 days. The latitude of the south cape as well as the 3 + 3 = 6 feathers of the wing confirm it. The torrential rains continued, but it also became bitterly cold. So, these rains were changing in ferocious snow and hail storms. The huge floodings continued, and many people died from starvation. The serpent encircles the planet Earth. It shows it was a worldwide Disaster. The 2 tips of the tail and the 6 feathers of the wing encode a total number of 2.6 million casualties. The third feather on the lower half of the wing has not fully been carved. The 2 tips of the tail and the 5 remaining feathers correspond to 2 + 5 = 7 units, encoding the 7 figures of this number. The 3 feathers on top count for two (Fig.1). Together with the 6 feathers of the Stone these encode the circumference of the planet Earth, 36 Moiras, or 360 degrees. It confirms it was a worldwide Disaster. The complementary latitude of 90o - 36o = 54oN encodes the percentage of casualties, 54%. So, the world population before this Calamity was (100/54) x 2.6 = 4.8 million people. The number of survivors was 4.8 - 2.6 = 2.2 million men. Many of them were seriously injured. The width of the serpent increases from 1 unit at the bottom, via 2 units around the Earth to 3 units at the top (Fig.1). The total number of 1 + 2 + 3 = 6 units confirm the Biblical Flood happened in the Sixth Dynasty. The single unit at the bottom shows it happened during the reign of the 1st king Teti (c.2370-2338 BC). Tree-ring dating indicates it happened c.2344 BC. The 2 units around the Earth confirm it was a two-stage event, having a total duration of 60 + 60 = 120 days. The three feathers on top point to the latitude line through the south cape of Greenland, at 60oN. It corresponds to the approximate periodicity of the Comet, c.600 years (a number of 3 figures). The 2 tips of the tail and the 3 feathers of the wing indicate an average latitude of 2.5 degrees above the Nile Delta, at 30o + 2.5o = 32.5oN (Poverty Point, NE Louisiana). The complementary latitude of 90o - 32.5o = 57.5oN encodes the exact periodicity of 575 years. The 2nd king Sahure of the Fifth Dynasty discovered the two southern crossings of the North Atlantic Ocean. His Pyramid is the first one located in Abusir ("Home of the god Osiris"), at the NW side of the Lake, which is just south of Gizeh. The 200-meter long procession road from the valley temple to his Pyramid is oriented due west. The groundplan of the pyramid temple is called the conceptual start of all other temples of the Old Kingdom. The walls of the complex were covered with reliefs having a surface area of c.10,000 square meters. These belong to the oldest of their kind. Behind an open space is a passage at right angles for the interior part of the temple. On the eastern wall are reliefs about sea voyages, one of the earliest about this subject. In the hart of the temple copper tubing is used for drainage purposes, probably imported from the Lake Superior region.27-31 It is probable, that the Sahara desert is called after this king. 1. Jim Lesley, personal communication. 6. De Jonge, R.M., and Wakefield, J.S., �The Discovery of the Atlantic Islands�, Ancient American, Vol.13, No.81, pgs.18-25 (2008). 7. De Jonge, R.M., �The Discovery of Three Continents (Santo Stefano, North Sardinia, Italy, c. 2300 BC)�, Ancient American, Vol.12, No.76, pgs.28-29 (2007), Ref.5. 8. De Jonge, R.M., �The Mystic Symbol, mark of the Michigan Mound Builders�, Ref.5, to be published. 11. Peiser, B.J., Palmer, T., Bailey, M.E., Natural Catastrophes during Bronze Age Civilizations, BAR International Series 728, Oxford, 1998 (ISBN 0-86054-916- X). 12. Baillie, M.G.L., �Hints that Cometary Debris played some Role in several Tree-Ring Dated Environmental Downturns in the Bronze Age�, Ref.11, pgs.109-117. 13. Peiser, B.J., �Evidence for a Global Disaster in the Late 3rd Millennium BC�, Ref.11, pgs. 117-140. 14. Courty, M.-A., �The Soil Record of an Exceptional Event at 4000 BP in the Middle East�, Ref.11, pgs.93-109. 15. Clube, S.V.M., and Napier, W.M., The Cosmic Serpent, Faber and Faber, London, 1982. 16. Clube, S.V.M., and Napier, W.M., The Cosmic Winter, Blackwell, Oxford, 1990. 17. Joseph, F., Survivors of Atlantis, Their Impact on World Culture, Bear & Co., Vermont 2004 (ISBN 1-59143-0-040-2). 18. Baillie, M., Exodus to Arthur, Catastrophic Encounters with Comets, BT Batsford Ltd., London, 1999 (ISBN 0-7134-8681-3). 19. Grondine, E.P., Man and Impact in the Americas, Kempton, Illinois (2005) (ISBN 0-9776-152-0-0). 21. De Jonge, R.M., �Discovery of America and the Flood (c.2300 BC, Ita Letra, Villarrica, Paraguay)�, Ref.5, to be published. 22. De Jonge, R.M., �The Discovery of Australia and the Flood (The Rainbow Serpent Shelter, Mt. Borradaile, Arnhem Land)�, Ref.5, to be published. 23. De Jonge, R.M., �The Brandenburg Stone, Comet Catastrophe of 536/540 AD� (560 AD, Battletown, Meade County, Kentucky), Ref.5, to be published. 24. De Jonge, R.M., �The Myths of Monks Mound (Cahokia, Illinois, 650-1400 AD)�, Ref.5, to be published. 25. De Jonge, R.M., �Four Ancient Stories (Poverty Point, NE Louisiana, c.700 BC)�, Ref.5, to be published. 26. De Jonge, R.M., �The Ikom Monoliths and the Flood (1200 BC-200 AD, Cross River State, Nigeria)�, Ref.5, to be published. 27. Rydholm, C.F., Michigan Copper, The Untold Story, Winter Cabin Books, Marquette, 2006 (ISBN 0-9744679-2-8). 28. De Jonge, R.M., �Petroglyph of a Sailing Boat (Copper Harbor, Upper Michigan, c.1640 BC)�, Ref.5, to be published. 29. De Jonge, R.M., �Copper Trade with the Old World (Poverty Point, NE Louisiana)�, Ref.5, to be published. 30. De Jonge, R.M., �The Battersea Shield (River Thames, London, c.190 BC)�, Ref.5, to be published. 31. De Jonge, R.M., The Phaistos Disc Decoded, New Testimony of a Lost Civilization, Mid-western Epigraphic Journal, Vol.20, 111-115 (2006), and Vol.21, 74-80 (2007), to be published.